It's a piñata, it's a cake—it's a chocolate piñata cake from Serenade Chocolatier. Yes, each cake-shaped molded chocolate shell hides a surprise: It’s filled with the chocolatier’s signature artisanal chocolates. This show-stopping, mouthwatering celebration of chocolate could be called the crown jewel of Serenade's decadent offerings. Even if the notion of a piñata cake forged of chocolate and filled with handcrafted treats isn’t enough to pique your interest (not that we can even imagine that), the story of Serenade will capture your heart. Bill Federer was a legendary Viennese chocolatier and Holocaust survivor. He came to the U.S. with nothing and, with the help of Jewish philanthropies, became a legend in Brookline, MA, for his incredible yet affordable chocolate treats. Current shop owner Nur Kilic was mentored by Federer until his death in 2006, and she continues the Viennese tradition of delectable chocolate delights. The shell of the piñata cake is made from milk or dark chocolate, and you can choose a 6" or 8" size. 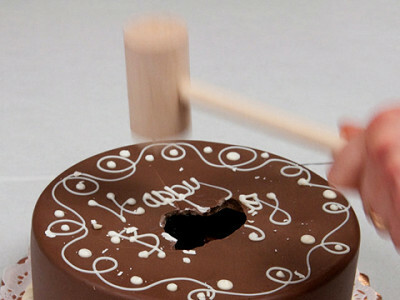 Then get ready to celebrate by smashing the shell with the included wooden mallet. Carrie Kuempel, who told us about this spectacular treat, tells us the smashed bits are perfect for melting with some cream for fondue. Prepare for pure chocolate bliss! Hello fellow chocolate lovers. I am very excited to share my passion for chocolate with you. We make all our chocolates in Brookline Village in our small open kitchen. The chocolates are all made with fresh natural ingredients. The chocolate piñata cake is a fun way to celebrate any occasion. It is gluten free! I am happy to answer any questions. These look exceptional!! Can you tell me about how many individual chocolates fill each of the cakes? @dennise: I agree, what an amazing treat this would be. There are 15 chocolates within a small cake and 30 chocolates within a large cake. Why do you say that the chocolate shell would be ideal for making chocolate fondue? Is it not the exact same chocolate used to make the chocolates inside the cake? Could it not be eaten as is, the shards resulting from breaking into the cake? @Anne Carol: Sure, you can definitely eat the molded chocolate as is. @Anne Carol: Hi Carrie here. I'm the 'finder' who recommended the fondue idea. You can absolutely eat the chocolate shell! It's just like in the Willy Wonka 'Candy Man Can' song: "You can even eat the dishes!" But if you do have any chocolate shell pieces left over, simply zap them in the microwave and add a little heavy cream to make a yummy fondue. We did this on New Year's Eve. It was like having a progressive dessert party! Yes, just eating the fabulous chocolate shell would be the best. Its the same chocolate as the items made inside. Is the dark chocolate vegan? @pam: Yes. But the items inside the cake are a mix of milk and dark. I bought one of these chocolate cakes for my daughter's graduation....it was a "smashing success"...not to mention....so yummy and fun for all! how long does delivery typically take. Want to order for b-day in March so just not sure how many days in advance to order to get it on day that I need it. Thx! Depending on where its being shipped, its best to order one week to 10 days before at least. @Nur Kilic: just to Harvard Square in Cambridge. Can you give an idea of the fillings of the chocolates for a 6" cake? I know it's a mixture of dark and milk, but am wondering what is inside of them. Thanks! LOVE this! What a perfect party cake. And I love that it's gluten-free and that the shell is vegan. Would be great to offer an entirely vegan version as well! How cute would little tiny individual-size ones be for wedding favors? @Julia: They would make very memorable wedding favors. Great ideas! Are the chocolates all peanut safe? We have someone in the family who is deathly allergic to peanuts. They look delicious! I love the idea! @Mary Ashley: We work with peanuts in our kitchen and the pinata cake has peanutbutter cups in it. How long do I have to place an order to receive it on or before Valentine's Day? @Gary: It's best to order as soon as you can, we are only 13 days away from Valentine's Day and it is our busiest time. The chocolate lasts at room temperature, 70 degress, for 4 weeks. The latest please order by February 7. @Nur Kilic: I went ahead and called in an order today. Thanks for the quick response via e-mail and sales order. @Tracy Scanlon: When you are at Step 3 of the checkout process "Shipping Method" there is a line below your shipping information that says "Check this checkbox if you want to add gift messages." When you checkmark the box a Gift Message box opens up. You are going to love these cakes! @Katherine Klinger: ok. is that going to get a custom message on the cake though? it sounds like its a message on a gift card? @Tracy Scanlon: You can use it for both purposes. To clarify you can write 'Message on cake' and/or 'Message on card'. Is your dark chocolate dairy free and vegan friendly? @Angela Bull: The dark chocolate is vegan, but the chocolates within the cake are both dark and milk chocolate. I bought this for my husband for Valentine's day. I am surprised it made it to a 2nd day !!! The "cake" tastes awesome, and he hasn't even hit the surprised inside!! I would NEVER hesitate to get this again !!! @Joanne Deschenes: We're glad the Pinata cake was well received and helped make your day special! Thanks for stopping back to share. @Joanne Deschenes: We had it for my sister's milestone birthday, too. It is truly a deliciously clever way to celebrate any occasion. Thank you for stopping by to share your experience. This is the second time that we are featuring Serenade Chocolatier's amazing chocolates and we are carrying over the conversation here. We are here to answer any questions you have. This was the perfect "out of the ordinary" Valentine gift for my husband! It arrived so well packaged that it was in perfect shape when he opened the box. 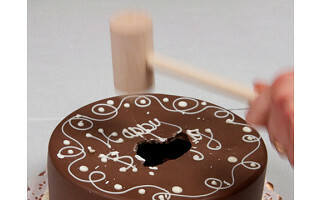 The chocolate "cake" is not flimsey -- it took two good whacks with the mallet to break through the top. The dark chocolate was yummy. I definitely recommend this tasty confection for any chocolate lover for any special occassion. @Peggy Hamblin: It's wonderful to hear that your gift was a yummy hit and that it arrived perfectly intact. Thank you for stopping back to share your experience. i ordered a cake and chose the option for a custom message. It did not give me a place towrite this. It later asked me for a message to go along with the gift. Is this what will be written on the cake? I am sorry for my confusion with this and appreciate your time. P.S. You have a great product!! @mary winter: There are 2 "custom" messages you can have: a short one on the cake & a longer message that will be on the packing slip. 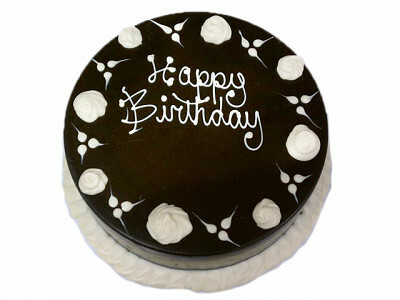 Our Customer Support Team will be in touch with you to get the message you want on the cake. Thank you for ordering the cake. I love this idea as a birthday present for my husband but he's NOT a fan of chocolate and fruit together (ie raspberry, cranberries, etc). He's a milk chocolate and truffle purist, although he'd like the viennese truffle or other nut items. Is there a chance to get this filled with specific truffles? @Christine: Great question. I can relate with your husband as being a "purist"; I'm into dark chocolate tho' ;0) Our Customer Support Team is looking into your request and will contact you directly. Hi, I am just wondering whether you ship it to Malaysia because my husband is working there and also such a hot weather there are the chocolate going to melt?And also can I order now but need to deliver on the particular day? It's a piñata, it's a cake—it's a chocolate piñata cake from Serenade Chocolatier. Yes, each cake-shaped molded chocolate shell hides a surprise: It’s filled with the chocolatier’s signature artisanal chocolates. This show-stopping, mouthwatering celebration of chocolate could be called the crown jewel of Serenade's decadent offerings. Even if the notion of a piñata cake forged of chocolate and filled with handcrafted treats isn’t enough to pique your interest (not that we can even imagine that), the story of Serenade will capture your heart. Bill Federer was a legendary Viennese chocolatier and Holocaust survivor. He came to the U.S. with nothing and, with the help of Jewish philanthropies, became a legend in Brookline, MA, for his incredible yet affordable chocolate treats. Current shop owner Nur Kilic was mentored by Federer until his death in 2006, and she continues the Viennese tradition of delectable chocolate delights. The shell of the piñata cake is made from milk or dark chocolate, and you can choose a 6" or 8" size. Then get ready to celebrate by smashing the shell with the included wooden mallet. Carrie Kuempel, who told us about this spectacular treat, tells us the smashed bits are perfect for melting with some cream for fondue.